Results for the 2018 Highland Yard are now available. Thanks to everyone who participated! Race Director Jack Russel was on 100.9 Canoe FM this morning talking all things Highland Yard and Places for People with host Mike Jaycock. Click the button below to watch the archived Facebook Live video. A heartfelt thank you to all the individuals who volunteer and the businesses who donate and enable us to do this fundraising event each year. Without them we could not make it happen! We're pleased to share a sneak peak at our 2018 Highland Yard mugs that will be awarded our 5k and 10K age group winners. These mugs have been handcrafted by local potter Bernie Nicholson of Pottery in the Forest and we can't wait to hand these out! The Highland Yard Race Committee has had the first planning meeting for the 2018 Highland Yard taking place on August 5th 2018. Just because it was our first meeting, doesn't mean we have not been hard at work! In fact, all of our SWAG is already on hand and ready for runners and volunteers to enjoy! As these pictures show, we were excited to try it all on! 2K runners will receive a white Highland Yard Fandanna, 5K and 10K participants will be receiving a Lightweight Running Toque perfect for keeping warm on brisk morning runs without overheating, and Volunteers will be adorned with Crimson Red Volunteer T-Shirts! Registration for 2018 Highland Yard Now Open! The Highland Yard Race Committee is hard at work getting ready for this year's race (taking place on Sunday, August 5th 2018) and we've started things off by launching our early bird registration: Save $10 if you register by May 31st! The 2017 Highland Yard Mugs have have arrived! These beautiful, handmade mugs, created by local potter Rickie Woods will be given to age group winners, our top pledge collector, and winning teams. Want to get your hands on one of these beautiful mugs? It's not too late to register and collect pledges! 2017 Highland Yard SWAG has arrived! Look what we have! Our 2017 Highland Yard SWAG has been delivered and this year we have some awesome long sleeve t-shirts for the 5K and 10K registrants and some cool and creative fandanas for 2K participants! We received some great feedback on last year's post-race survey and based on those comments we have broken the 0-19 age group for the 5K and 10K events into two so the 'big kids' are not directly competing with the younger kids for recognition. Our new age groups will be 10-14 and 15-19. Those under 10 choosing to run either the 5K or 10K will be placed in the younger age group. All other age groupings will be the same as previous years. The 2017 Highland Yard has made some changes for the run this summer. First, we have moved ALL the start times for the races to earlier in the day to try to beat the heat and humidity of August. The 10K will kick off at 9AM sharp, followed by the 5K at 9:15AM and the 2K at 9:30AM. This means that Registration will be closing at 8:30am and a bit earlier start to the day for you. Second, we are reducing the cost for teams – please check out the new rates – and sign up as a team and get the benefits. We look forward to seeing you on August 6th, bright and early! Our photographer took over 400 great photos of this year's event. You are bound to find yourself or someone you know in one of them! Visit our Google Photos photo album to view them all. The results are in! Thanks everyone for a great day yesterday. Visit http://splitstiming.com/highlandreportallresults for race results. JoAnne Sharpley's Source for Sports in Haliburton Supports the Highland Yard and Places For People! 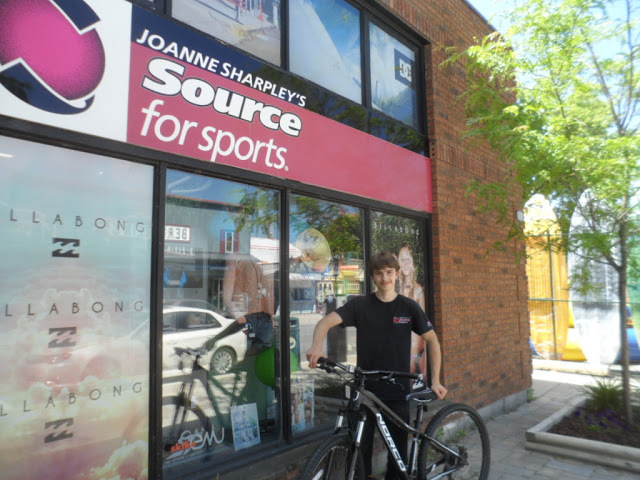 Participants in the Highland Yard on August 2nd who collect pledges for Places For People will be rewarded with gift certificates redeemable at JoAnne Sharpley's Source For Sports in Haliburton. The more you collect the greater the gift certificate you will receive. Haliburton's Nick Emsley, mountain biker and store staff member. Minden Times: Places for People seeking board members. CTV News Barrie: Helping families in Haliburton County! Listen to our Race Director, Jack Russell, talk about the Highland Yard. At the time, we only had 20 registrants... but we're happy to report we have more and more everyday! Earl Cooper talks about piping for the Highland Yard, a long standing tradition! The Highland Yard is a tradition steeped in history. Listen to Jane Boyd discuss the origins of this race. Listen as Sue Shikaze talks about the Highland Yard from the runner's perspective, including improvements to the event, the 2K walk, and ways to train for the 10K and 5K run. Want to know how to prepare for the Highland Yard? Tina Newman, Registered Massage Therapist at Highland Chiropractic & Wellness Centre, tells us how start off the race on the right foot. Todd Houston talks about organizing the Highland Yard with Kilcoo Camp, and the massive job of manually calculating the timed results before chip technology automated timed road races. Please contact info@highlandyard.ca to get in touch with our committee. We would love to talk with you. A big thank you to all of our runners and volunteers who made the 2014 Highland Yard a resounding success. Be sure to view the 2014 Highland Yard Google Plus Photo Gallery, you might just see yourself! The results for the 2013 Highland Yard are up! Thank-you for making the 2013 Highland Yard a success! Thank-you for making this year's Highland Yard a resounding success! Thank-you to all of our participants today, and we'll see you again next year! The Highland Yard is a fundraiser to help Places for People provide affordable housing to those in need throughout the Haliburton Highlands. Haliburton County Non-Profit Places for People Corporation creates secure affordable rental housing in Haliburton County for those at risk of homelessness, and supports our tenants to make a positive difference in their lives.